PES 2015 has in its cast the biggest stars of the football world, separated by several teams and selections. As football is not only made of star players, the game also brings the less talented players. Check out the list of the worst players of the Konami video game. Owner of the least desired position of the game, the Arabic Al Sultan is the synthesis of all the defects of a midfield. Slow, inaccurate and physically weak, the player has anything to hurt any team. Able to work in various midfield positions, Mohammed is proof that less is more. The player shows rare inefficiency in the most basic essentials such as ball control and short passes. The French center forward has size to command respect within the area, but touches on the very lack of category to become one of the worst athletes around the game. Born in Qatar, the midfielder is still young, but not the little experience could save him from place among the most disastrous players of the game. The highlight was the complete lack of precision with the left leg. The Arab defender has difficulties in various imaginable attributes, including the defensive numbers, his supposed expertise. With a defender of these must be difficult to keep the mess away from his area. Only 18 years old, is acceptable to the attacker River Plate is not among the best. However, his poor attributes finished putting in the least prestigious list. Despite the respectable physique, midfielder French striker has no special skill that can take him off the end of the list. The player has absolutely ordinary numbers in all attributes, passes the speed. Al Shamekh and its many other list countrymen are the explanation for the little tradition of Saudi Arabia in football. The defender sins in extremely basic attributes and can ruin a game alone. The player meets several inadequate characteristics for attackers, since his short stature to the serious difficulty with the left-handed. 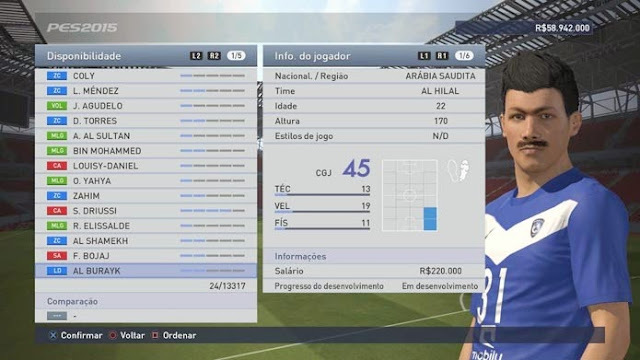 To close the list, another player from Saudi Arabia. This time is the right side Al Burayk, demonstrating such intimacy with the ball as his countrymen listed above.